I love being a photographer in Cache Valley, Utah! It is one of the most beautiful areas in the world, and having lived here my entire life, I'm not biased at all. In all reality though, it's a wonderful place with many many photo ops. Alice is a photographer herself, so for her high school senior session, we needed to incorporate that into her photo story. I love that she wanted to help us create her session. It is always great when a client gives their input into their session. It helps give us the ideas into what they're hoping for, but I appreciated that she also didn't have a fixed idea on exactly how it had to go, so we still had our ability to create intact. 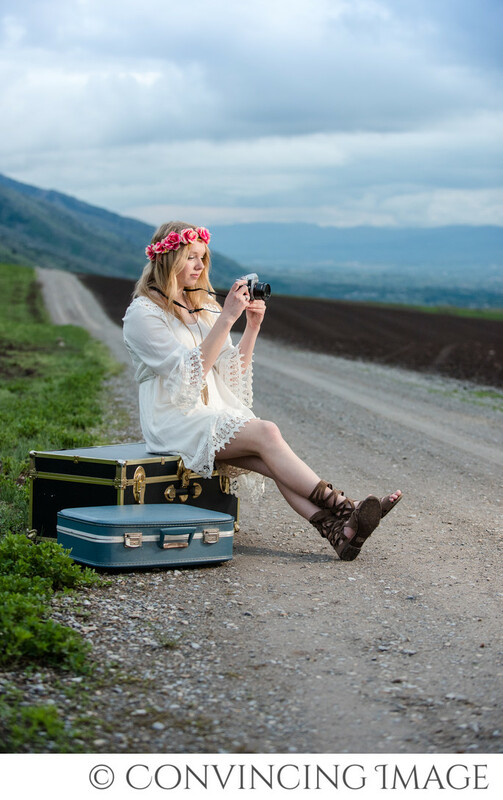 As a senior at Sky View High School, Alice was also in the marching band, playing flute, and besides photography, she also enjoys playing her ukelele and traveling. We incorporated all of those aspects into her session. The sky turned dark quickly, but with our studio lighting on location, we were able to keep the pictures well lit with soft lighting, while still keeping the background highlighted. Now this lovely lady is off to college, where she is pursuing her love of photography as well as other schooling endeavors. I can't wait to see where the wind takes her!